There are a lot of articles about ASP.NET MVC and Model Binder. I didn’t find any real-world article about Model Binder of Many To Many relation. So I decided to write this post and share my experience on this topic. Although I will explain easily and step by step my approach, readers of this article should have as prerequisite the knowledge of basic concepts in ASP.NET MVC as Controller, View, Model, Model Binder and Scaffolding. 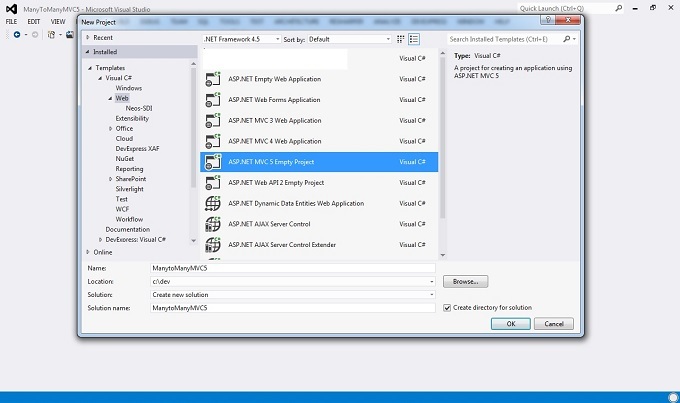 In this post I will use ASP.NET MVC 5, Entity Framework 6.1.1 and Visual Studio 2012. 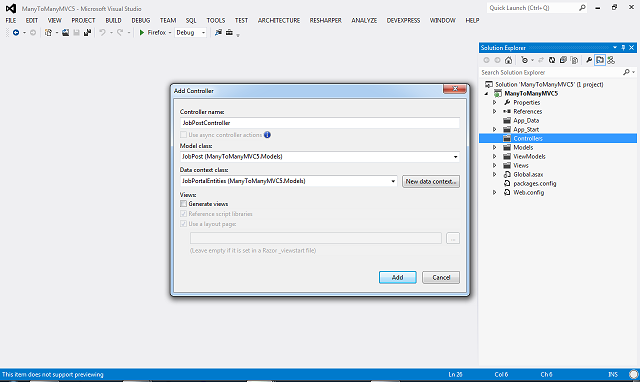 To add MVC 5 support in VS2012 you have to check this link : ASP.NET and Web Tools 2013.1 for Visual Studio 2012. You can add Entity Framework 6.1.1 through NuGet. My approach should be not the best, but it works well. Now we have to add Entity Framework 6.1.1 from NuGet. We are ready to create a model and import these tables and relationship in onr project. Add a new model to the project by right-clicking your Models folder and selecting Add>New>ADO.NET Entity Data Model. Select the 3 tables to add to the model : Employer, JobPortal, JobTag and JobPortal_JobTag. Check the option “Pluralize or Singularize generated object names” and let other settings as default. Note that the two entities have a ICollection property to each other. Surfing internet you will find many interesting articles and posts on Model View Controller ASP.NET pattern and how it is easy to create MVC projects. But in the real-world the things are different and we have to enhance our approach. In ASP.NET MVC we can use Scaffolding to quickly generating a basic outline of our application that we can edit and customize. So we can create automatically controllers and strong-typed view to perform basic CRUDL operations on our entities. Unfortunately ASP.NET MVC scaffolding doesn’t handle many to many relationship. I think that the main reason is that there are too many kinds of many-to-many user interface creating/editing. Another issue is concerning the automatic ASP.NET MVC Model Binding. As we know, model binding allows you to map HTTP request data with a model. Model binding makes it easy for you to work with form data because the request data (POST/GET) is automatically transferred into a data model you specify. ASP.NET MVC accomplishes this behind the scenes with the help of Default Binder. If we have a Many to Many relationship in the user interface we will have some kind of interface that allow user to perform multiple choice. So we need a complex type in our view to bind the selected items, as a Check Box Group or List, or a Multiple List Box. But let see the issues in action . Note: If you get an error message that says “There was an error getting the type…”, make sure that you built the Visual Studio project after you added the class. The scaffolding uses reflection to find the class. Now you can run the application and browse the pages. It is amazing …!! But .. we don’t have any track about Many to Many relationship !!! To overcome these issues, my approach is based on ViewModel entity. View Model represents data you want to have displayed in your view. Easily is a class that represents data model used in a specific view. In our case our View Model contains the data of the JobPost, the data of all available JobTag and the data of the selected JobTag. We start to modify the View Index ( it is associated to the Action index of the JobPostController ) and let it to show the list of the associated JobTag to a JobPost in a Listbox. So we add a row to the table in the index.cshtml. Now we can run the apps … in the index you will see a ListBox with all Tags for the post. It was easy. The first problem is to pass to the view the list of all available job tags. The second problem is to mark as selected the associated ones. Now comes in the Model View !! 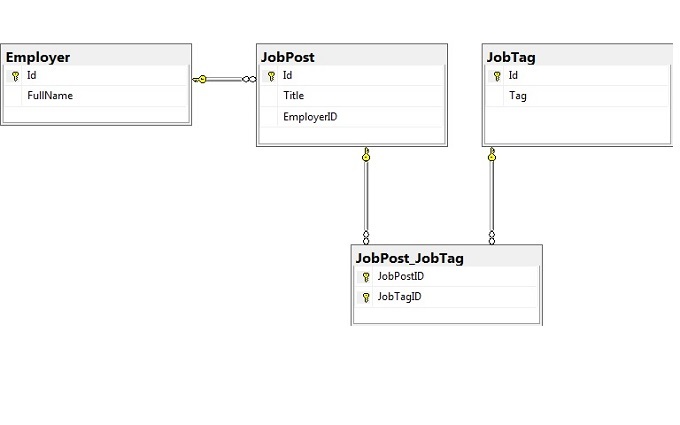 In the modified action method we use the JobPostView entity. We load the propertiy JobPost with the selected job post including the eager loading of JobTags entity, and the property AllJobTags with a ListIntem builded form the JobTags and return to the View the ViewModel instead of the Model. Now we can modify the View. We change the ModelBinder to ViewModelJobPost and all the property. We add the ListBox binding. Note the the query string use the “JobPost.<FieldName>” and that we have multiple SelectedJobTag. from the controller JobStatus is called. MVC5, becuase its ModelBinder, will automatically map the value on the query string to the related property of the class JobPostViewModel injected in the Action. We could override this mechanism for a more complex ViewModel object using the [Bind] decorator with the Action. But this is could be a subject for a new article. I hope I gave you a first idea about what is behind the scene with binding in ASP.NET MVC. ASP.NET MVC5 with its Scaffolding mechanism too often has huge limitation in real world application. In this article I tryed to explain you how to use ASP.NET MVC in real world with a simple example about the implementation of a Many to Many relationship. The example is really a basic one, but I hope that you got the idea behind the Binder and the ViewModel, so you are ready to go alone to the next level starting to modify the “create” feature in the enclosed sample project. People could think to use other mechanisms like PropertyBag/ViewBag instead of ViewModel for example to pass other data to the View. You will lose the AutoBind mechanism and it also is definetly not correct from the point of view of S.O.L.I.D. principles, TDD approach and Design Object Oriented in general. This entry was posted in code first, entity framework and tagged codefirst, entity framework on January 31, 2015 by Gurjeet. Here, we will see how to configure Many-to-Many relationship between the Student and Course entity classes. Student can join multiple courses and multiple students can join one course. Visit Entity Relationship section to understand how EF manages one-to-one, one-to-many and many-to-many relationships between the entities. As you can see in the above example, .HasMany<Course>(s => s.Courses).WithMany(c => c.Students)says that Student and Course has many to many relationship with Students navigation property in Course class and Courses navigation property in Student class. Map method takes Action type delegate, so we can pass lambda expression wherein we will specify FK property name of Student (we start with Student entity, so it will be left table) and FK of Course table. ToTable will create StudentCourse table.